Adventureland in Iowa has announced a major new roller coaster for 2016! “The Monster” will be a Gerstlauer Infinity coaster featuring high speed thrills, being the park’s first coaster manufactured at Adventureland since 1993. The coaster will feature a 2500 foot-long steel track, 133 foot vertical lift hill, 5 inversions, a 101 degree first drop and 10 “airtime” moments, and travel at speeds of up to 65 miles per hour. It will also cross the park’s “Sky Ride” eight times and boast the first negative-G stall loop in the western hemisphere. Park visitors on Wednesday were excited to hear about the project. “Pretty excited, we’ve needed a new one here for a while. I love roller coasters. They are my favorite things to ride,” said Heather Heller. “I am excited to see it. I am really big time fan, I would say so,” said Chris Wilson. “I am really excited. I am glad because it looks really fun and scary — I like scary things,” said Jasmine Wever. To make room for the new coaster, named “The Monster,” the park will be replacing the log ride. The log ride has been a staple at the amusement park since it opened in 1974. “The log ride is over 40 years old, and while still structurally sound, technology for rides has advanced by leaps and bounds in that time period. It is requiring an enormous amount of upkeep and maintenance that isn’t feasible long term. We promise to provide our fans with a suitable replacement, sooner rather than later,” park officials said in the announcement. 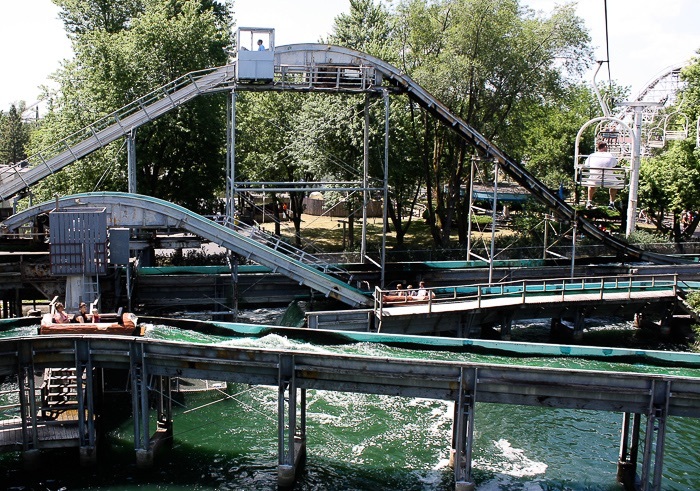 Adventureland fans have until Labor Day 2015 to take one last ride on the log ride. After that, construction will begin on the new coaster. What do you think of The Monster? Post your thoughts in the comments down below!